Hollywoodland (2006) Review - Movie Review | Squackle.com! The Funniest Site on the Net! I don’t know what to say about it, I’m sort of indifferent after watching this movie. 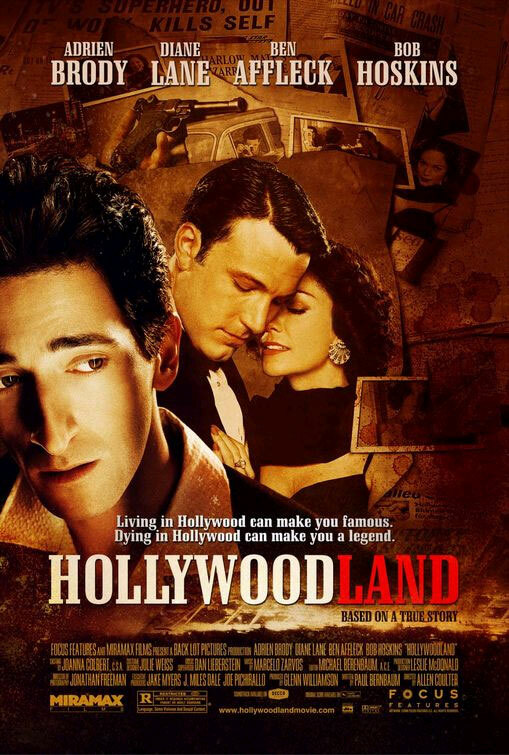 Hollywoodland is a movie starring Ben Affleck and Adrien Brody, about the conspiracy around George Reeves’ (aka as Superman) death. Private investigator Louis Simo intends to excel his career as a private investigator by taking an interest in the case — a supposed suicide, in which the mother thinks that her son was actually (oh no) murdereeeeddd!! I think the movie was worth watching, though a bit on the long side. The story could have definitely moved faster, there wasn’t exactly a lot of story elements that would have been cut, it just seemed like there was a lot of dwelling on certain things that happened. There were a lot of good things about the movie, like good acting, the music/soundtrack, and the writing for the most part. It felt like they didn’t know how to end it, so they just did. I assume the real case was left unsolved, so they had to do that, but it felt weird how it ended. Perhaps what added to that weirdness and longness of the movie was that it was like watching 2 movies going on at the same time. It was very hard to tell what was the past with George Reeves (Ben Affleck), what was the present with Louis Simo (Adrien Brody), and what was Simo’s theory sequences. In that regard, cinematography didn’t do anything overly ambitious to set the three elements of the movie apart from one another. It was interesting seeing Bob Hoskins in another movie besides Who Framed Roger Rabbit, too. It could be conceivable to see the ending as a cop out, now that I think about it. We spend about an hour and a half learning about George Reeves, and Simo’s quest to learn about why Reeves is dead, and we end up seeing Simo making amends with his son. It could be construed that Simo was supposed to have learned something from going through all of that, but it wasn’t portrayed very well.